P-2762. A FINE JALISCO SEATED DWARF “MESSENGER” HOLDING HIS HANDS OUTWARD, AMECA- ETZATLAN STYLE, PROTOCLASSIC, ca. 100 B.C. to A.D. 250. Provenance: Acquired with 4 other objects found together in 1969. They were created by the same hand in antiquity. Please see P-2761 and P-2764. From an Alabama Private Collection formed during the 1960s. 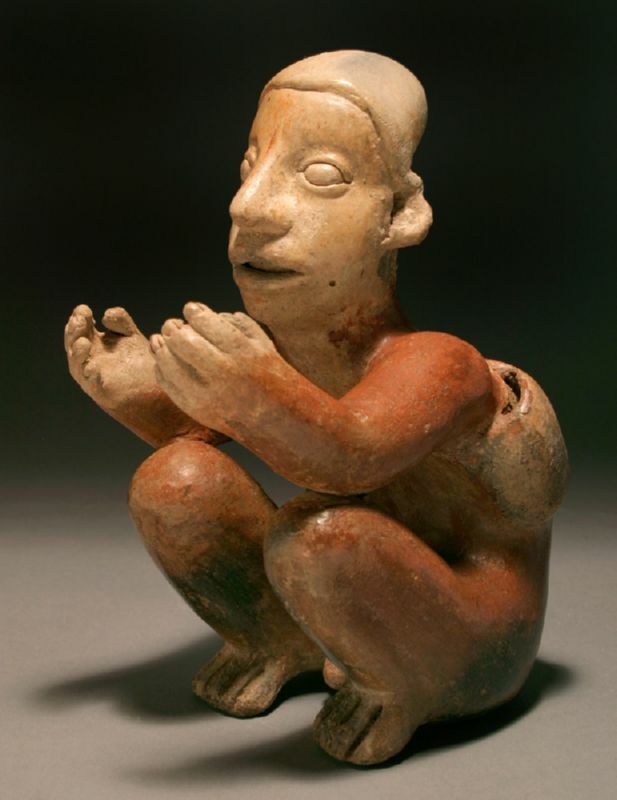 This superb example of the Jalisco ceramic tradition, with attenuated torso and relatively straight back seated with his hands held outward, stares forward as if appealing for something. He is decorated with nothing except for a bag hanging on a strap around his shoulder. He is pigmented red and cream, with remains of black. The dwarves carrying small sacks on straps are sometimes referred to as “messengers”, as they may have delivered news and objects between villages. This example is unique due to the lack of unnatural curvature in his back.